Have I been under a rock (always possible, this time of year), or is this breaking news? 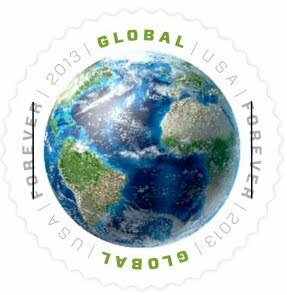 I just learned that international first class stamps - currently $1.05 - will go up to $1.10 on January 27, 2013. Oh dear. It seems so recent that they just changed to $1.05, but I guess that was way back in January (2012). You can learn more about the stamp on the Beyond the Perf stamp preview, which is also a lovely way to get a look at the new stamps to be released next year. UPDATE: Thanks to Derrick for alerting me that regular first-class domestic stamps go up to 46 cents next month as well. It's news to me, too. Thanks for the heads up! Regular rate goes to .46 as well. Thanks for the info - I hadn't realized! Thanks. I love the new stamp, and am glad it's forever. Really? What a total bummer! The rates for Canada and Mexico also move to the same as other international postage rates for the first time. I think the new stamp is beautiful. I'm not certain about that. The link above to the new stamp says "For the January 27, 2013, price change, the Global Forever stamp may also be used to mail a 2-ounce letter to Canada." Note the 2 ounces. To other countries it is one ounce, which leads me to believe the 1-ounce rate for Canada is still lower. If you have a link to any definitive information from the US Postal Service, please do share it. Well, I should research before I comment! What I'm seeing, though possibly out of date, does indicate that the $1.10 rate is for all international destinations, but that it covers weights up to 2 ounces to Canada. Hmm. I haven't verified at my local post office, but this is what I read online. I was wondering, as you seem to do postcrossing a lot, have you ever had any bad experiences? I'm obviously a bit wary since there are no postboxes in my town so I'd have to give up my address, isn't there a huge risk that creeps will get onto the page and register just to find people to creep on? I don't know..
Anny, thanks for the compliments on my blog. 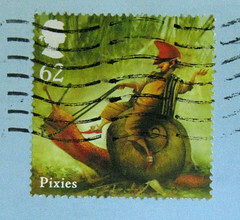 As for your questions, I've written quite a lot of blog posts on Postcrossing. You might want to read some of them for flavor. The worst experiences I have had with Postrcossing are pretty mundane - people sending deliberately religious cards with preachy messages, or not sending a card at all. You must send postcards before you receive postcards on Postcrossing, and it seems a very expensive and work-intensive way for people to be internet stalkers. After all, you have no idea whose address you'll get, or what country they'll be in, so it's patently impossible to target a specific person, or even a group of people. I've had my share of weird internet/blog stalkers, but none of them have come from Postcrossing. That being said, everyone has their own level of comfort. I do not use my home address for my mailing address - I have a rented box - and lots of other folks do, too. You have to figure it out for yourself. If you are interested in exchanging mail, pen palling, and the like, you'll have to figure out some address to give to folks, but how you do that is up to you. That stamp is AWESOME. Thanks for sharing it. I never would've known.